Hector Duarte first traveled to Chicago’s Pilsen neighborhood in 1978 as a young art student. “I was completely stunned,” he said. He had been encouraged by one of his instructors at the Siqueiros Workshop, created by the widow and colleagues of the great Mexican muralist David Alfaro Siqueiros, to tag along to an international muralist conference in Chicago. It was a life-changing experience, he says – not only because of the artists he encountered, but because of the electricity of the burgeoning Chicano muralist movement, whose epicenter, at that time, was Pilsen. “I said, ‘Wow, here is exactly where I want to stay and practice,'” Duarte recalls. Seven years later, he returned to collaborate on a project at 26th Street and Kostner Avenue. He ended up staying, marrying, and starting a family in Pilsen. 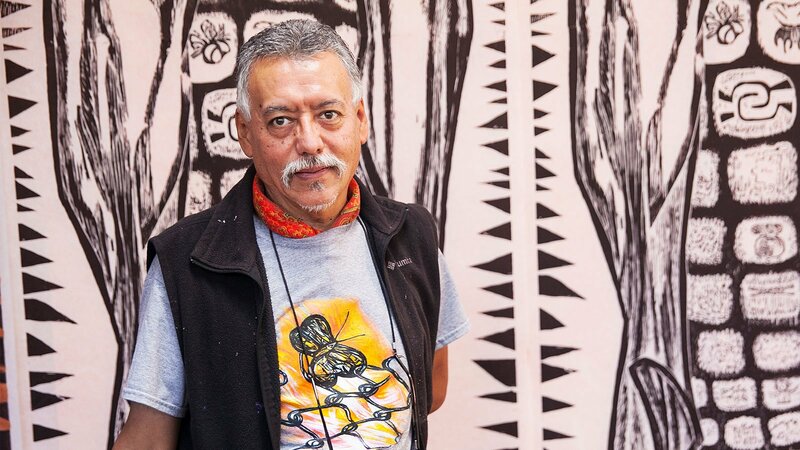 Today his work adorns several neighborhood landmarks, including the Rudy Lozano Chicago Public Library, the Benito Juarez Community Academy, and an “L” station in Pilsen. His home and studio have themselves become a destination, as they are covered with a 3,000 square foot mural of a Latino giant, tangled up in barbed wire along the border. Over the past thirty-plus years, Duarte has created more than 50 public art works throughout the Chicago metro area, much of it exploring similar themes of identity, migration, and borders, and telling the stories of Mexican immigrants in Chicago. Duarte says his bold and colorful murals are intended not only to beautify the neighborhood, but to carry on a strong Mexican muralist tradition that seeks to educate, inspire, and engage with the public. His chosen canvas is deliberately accessible to all – including working-class people and those who might not typically visit galleries. Duarte thrives on public engagement – whether in schools, where he’s taught and worked with local youth; in museums like Pilsen’s National Museum of Mexican Art, where, in 2009, he created a mural in public view; or on the street, where curious passersby often ask him about the mural that blankets his home. In the video below, peek inside Duarte’s studio as he explains more about his inspirations, his influences, and the dominant themes in his work.